Should I be using dental floss? A blog examining the latest news that there is insufficient proof to back up the claims that dental flossing should be an essential part of your oral hygiene. I only recently blogged about the benefits of dental flossing, as it is long been regarded that dental flossing is key in ensuring you have healthy gums and teeth. Health Organisations across the world have been recommending flossing for decades – so what has changed? Last year, journalists from Associated Press (a newsgathering organisation), requested the US health department to provide their research that flossing was beneficial. Following this, the US government has now admitted that there is no scientific evidence to provide the benefits claimed. On what basis is it claimed that dental flossing is beneficial? It has been said that flossing your teeth can help to prevent gum disease and tooth decay by removing the pieces of food and plaque that build up between your teeth and at the gum line. It is also suggested that it helps to reduce bad breath by removing food debris from the mouth. Journalists from Associated Press also looked at research on flossing that was conducted over the last decade and concluded that most of the research failed to demonstrate that flossing is genuinely effective in plaque removal. This advice mirrored that released by Public Health England and in the UK there have now been a number of calls to carry out research as to the long-term benefits of dental flossing. From the statements released by health organisations in the last week, it seems that the key message is that cleaning between your teeth is still beneficial. It also seems that now the focus should be on using interdental brushes to clean between your teeth and only using floss if the spaces are too small for a interdental brush. 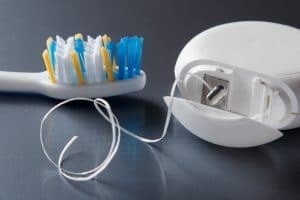 If you are unsure of how dental floss should now fit into your oral hygiene routine then I would recommend that you discuss this with your dentist to ensure that you are not causing any damage to your teeth and existing dental work by flossing.